Immigrant Families Together is a movement to help reunite detained parents with their children. With grassroots effort and community donations, we have successfully bonded out Yeni Gonzales and she's held her kids again ( https://nyti.ms/2lRD7jy)-- there is a long line of moms waiting to do the same. NOTE: Rosayra’s goal has been increased because we are raising additional funds to support Rosy's family as they settle in the U.S.
Rosayra is the 6th mother we are helping. Thanks to an anonymous supporter who loaned us money to bond Rosayra out at the same time as Lilian (whose bond was raised with GoFundMe donations) and Floridalma (whose bond was paid in full by a donation from the Hispanic Federation), Rosayra will arrive in New York, where her children are in foster care, on Friday, July 13. The funds raised will repay the supporter who floated her bond money and will cover her transportation from AZ (she will be the first mom we have bonded out who will fly, with an attorney accompanying her) to her destination. 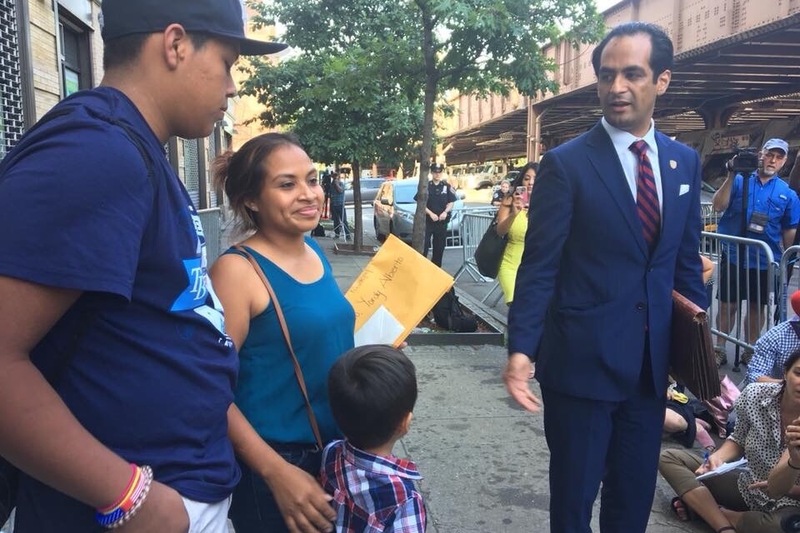 Funds raised beyond the bond amount, $12,000, will be used for Rosayra to support her children while going through the immigration court proceedings. She will also, at her discretion, use some of the funds to repay a debt that she took out in Guatemala to pay for her migration journey to the U.S. The repayment of this debt is essential, as an unpaid debt could put her family in danger. Any funds raised beyond the $25,000 goal will be used to reunite other families. Anyone can donate to Rosayra's fund, though her primary sponsor is the Congregation Beth Elohim Refugee Task Force, based in Park Slope, Brooklyn, New York. Beth Elohim will provide ongoing concrete and moral support to Rosayra once she arrives in New York. Congregation Beth Elohim (CBE) is a welcoming and inclusive synagogue in Brooklyn, New York ( www.cbebk.org). The Jewish value of tikkun olam, healing the world, is at the heart of CBE’s identity and inspires our community to work to protect human rights, stand with vulnerable communities, and defend democracy. For the past three years, volunteer members of the CBE Refugee Task Force have engaged in initiatives supporting refugees and the immigrant community through political activism, community education and direct assistance abroad and in the U.S.
Rosayra CAN be reunited with her children and we're determined to help her, working in conjunction with her attorney, to reunite them. 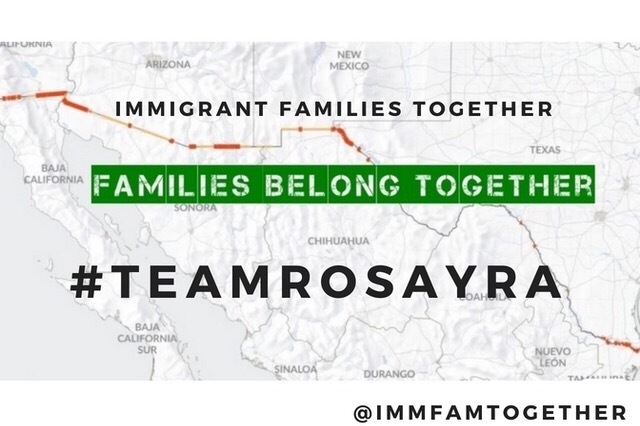 We will be paying Rosayra's expenses related to her release, transport from Arizona to the state where her children are, and paying for her accommodations, food, cell phone, and other expenses, as well as providing her with support to attend appointments and reunite with her family. The funds will also be used to prove that Rosayra can support her children. We are not related to Rosayra or her attorney by blood. We are a community of concerned parents and citizens who don't support the current separation policy and want to do our part to reunify Rosayra with her children. We will withdraw all donated funds to Julie, the leader/organizer/founder of Immigrant Families Together. They will then be transferred to her attorney or Rosayra. Expenses to be paid include: Expenses related to release, transportation from Eloy, Arizona, lodging, food, local transportation, cell-phone, and other expenses Rosayra may incur as part of her reunification, including but not limited to costs of preparing for her court appearances (copies of documents, etc). El grupo de Familias Inmigrantes Unidas (www. immigrantfamiliestogether.com) es un movimiento que ayuda a reunir a los padres que han sido separados de sus hijos bajo la politica de cero tolerancia. Con ayuda de la comunidad y sus donaciones, hemos podido ayudar a pagar la fianza de Yeni Gonzalez y gracias a esto Yeni a vuelto a ver y abrazar a sus hijos de nuevo ( https://nyti.ms/2IRD7jy). Desafortunadamente hay una larga fila de padres en su misma situacion esperando reunirse con sus hijos. Rosayra es nuestra 6ta mama que estamos tratando de ayudar. En este momento Rosayra se encuentra detenida en un centro de detencion inmigratoria en Eloy Arizona. Su fianza es de $12,000 dlls. Sus hijos han sido transferidos a otro estado. Rosayra PUEDE ser reunida con sus hijos si todos ayudamos, trabajando en conjunto con su abogado. En este momento estamos realizando un modelo de trabajo para que otros ciudadanos puedan replicarlo y ayudar a otros padres ser reunidos con sus hijos. No tenemos relacion de sangre con Rosayra o con su abogado. Somos una comunidad de padres preocupados que no apoyamos la poliza de separar familias al cruzar la frontera. Los fondos seran retirados por la fundadora de Familias Inmigrantes Reunidas Julie Schwietert Collazo. Los fondos seran transferidos a el abogado de Rosayra. Los gastos a pagar incluyen: gastos relacionados a su liberacion, transporte de Eloy Az, alojamiento, alimiento, transporte local, celular y otros gastos necesarios para la reunion de Rosayra con sus hijos. Ademas de pagar gastos legales para la preparacion de su caso ante el juez. In my excitement over Rosey’s son’s birthday, I forgot to mention the crucial group that has not only offered so much in financial support, but also is providing Rosey and her family with strong community and both material and emotional support. The congregation Beth Elohim in Brooklyn has shown a love and generosity toward Rosey and her family that is truly transcendent, and a model for us all in how to treat our fellow humans. Thank you, from the bottom of our hearts, for not just welcoming Rosey and her family with open arms, but also continuing to walk with them through this difficult time and process. Today is Rosayra’s older son’s birthday! She is throwing him a small party, and is going to surprise him with a used laptop someone donated. Do you know why she can do all this? BECAUSE OF YOU! Because of your generous support, she is enjoying this day and hugging her boys, instead of spending it in detention, wondering where they are and how the older one was spending his birthday. Although this is a joyous day, they still have a long road ahead of them (you can read the article below for more details,) and there are many women still detained and separated from their children. But that’s why we keep working to reunify them, one family at a time. You have been, and continue to be, a crucial part of that work. Rosayra and her children were permanently reunited yesterday, due to the amazing generosity of the members of Congregation Beth Elohim, and our other wonderful donors. As you can see in the picture, her face shines with the joy and solace you have brought her. We have increased our target to $25k in order to sustain her and her children in accordance with federal poverty guidelines for at least a full year, as the conditions of her release do not allow her to even look for a job for the next five months and they have no other support here. This support will allow them to stay in New York to continue the asylum process.